De-evolution could use some help. Please research the article's assertions. Whatever is credible should be sourced, and what is not should be removed. Not to be confused with political devolution, which is not necessarily the same. Nor with those odd chaps from Ohio. De-evolution or devolution is a idea that a species is actually evolving "backward". Biblical literalists often favor the concept: they like to view Adam and Eve as perfect beings who were created, and hold that the subsequent human race has "devolved" from that perfection. De-evolution is sometimes formalized by the assertion that all (or most) mutations destroy information, rather than create develop information. Cynics and misanthropes also use the term "devolution" to refer to the perceived increasing dominance of the stupid. The term "devolution" is sort of a misnomer as evolution and natural selection do not have a definitive path forward so there can't really be backward evolution — although biological evolution is guided by natural selection, the selection process is not goal-oriented but rather favors adaptation to the current local environment, which itself is subject to change and evolution. In this sense, evolution can be an unguided process. As a result, the concept is usually a plea to emotional attachment that humans may have for their own perceived superiority. In the cold, reasoned light of science, however, such a notion doesn't hold, and unguided evolution — neither forward nor backward — is the dominant theory. If changes to a species were specifically controlled in a way that each change was reversed in order, it might be accurate to call the act "devolution",[note 1] but this would require a perfect history of the organism's genetic makeup by each generation and a flawless means to control the changes. This would make for excellent research into genetics... were that knowledge not already necessary for such exotic manipulations. Even so, this is no more "un-evolving" something than flattening Play-Doh into a pancake and rolling it back into a ball is "un-pancaking". The concept of devolution is similar to that of "dysgenics," in which eugenicists bemoaned the decline of humanity as the rabble were supposedly outbreeding the better stock. Consider a cave-living fish which loses its power of sight because it is not needed in dark conditions where sight is useless anyway. Believers in de-evolution would cite this as a prime example of an ability that is lost, possibly forever, and devolution from the perfection of creation in action. However, considering the reality of evolution guided only by external environmental pressures, this interpretation makes little sense and the adaptation of sight being lost can be thought of more generally: looking at what survival advantages such an adaptation may allow. Sight is no longer necessary to this example fish, so the evolutionary process has no reason to preserve it — fish born without sight would be at no specific disadvantage compared to their sighted counterparts. In fact, the blind fish now has a better chance of survival and reproduction compared to its sighted colleagues, which waste energy on a very unnecessary function that exposes them to infection and injury. The blind fish has become better adapted to its present surroundings — it has not "devolved". Similarly, those citing humanity's loss of agility, sight, or overall fitness when compared to ancestors don't take into account the increased mental capabilities (shown by inflation of IQ over time, for instance) as time goes on, which allows for increases in technology and medicine that prolong life and survivability better than standard physical capabilities would. In fact, there is a bias held by many people that humanity will continue to "evolve" into a more intelligent being — but there is no biological reason for this to be so. If less intelligent people were favoured by natural (or sexual) selection, or if they were more liable to reproduce for some reason, then humanity would move in the direction of having less intelligence. 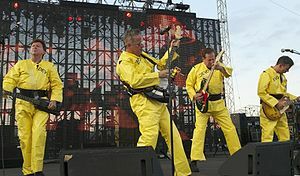 The term was popularized by the band Devo (the name itself is a reference to de-evolution) in their song "Jocko Homo." The singer repeatedly asks "Are we not men?" to which the others reply "We are Devo!" In creationist circles, "de-evolution" is the strange concept that all "micro-evolution" is the corruption of the perfect creation, after the sin of Adam brought about mankind's fall from grace. This shows a strong anthropocentrically biased view of evolution. While it is possible that an intelligent species could, over the course of evolutionary time, become less intelligent, it would presumably be because (like the sightless cave fish) the energy they spent on building brains could be better spent on, say, improving their jaw strength, or resisting nuclear radiation, or what have you. This is not "de-evolution" — it is "evolution in a direction away from human ideals". Sometimes a show takes it to a more literal (and stupid) level, such as one episode of Star Trek: the Next Generation in which the crew experiences "devolution" that literally turns them into successively more primitive creatures in their species' evolutionary past (into more primitive primates, in Picard's case). "Devolution" is a term used by Michael Cremo and his Krishna buddies to describe their views on the origins on the human species. According to him/them, humanity has "devolved" from pure spirit. ↑ But to be pedantic about it, the established word for the opposite of "evolution" in other uses of the word, such as in mathematics, is "involution". This makes sense in the light of etymology, for the Latin preposition e means "out (of/from)", and in means "in(to)", while de means "down from". ↑ This is then used as a springboard to talk about the human race through the miracle of analogies. This page was last modified on 2 December 2018, at 12:52.